Three people have escaped injury after an arson attack at a house in County Down in the early hours of Sunday. 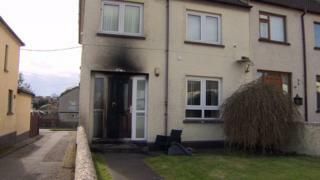 The front door of the property at Granville Gardens in Banbridge was set on fire shortly before 05:30 BST. Neighbours said it was the second time the property had been targeted in recent months. A police officer said he believed the attack was carried out by three people who then drove off along Edenderry Road in a "saloon-style car". Det Sgt Colin Patterson added: "Thankfully the fire was extinguished before it could spread to the rest of the house. "A woman in her 50s and her two adult sons who were inside at the time were not injured."